This page provides a video archive of presentations at the annual SSEP National Conference by student researchers whose experiments were part of the SSEP Mission 12 to ISS Mercury experiments payload. Mission 12 to ISS was the fourteenth SSEP flight opportunity. Mercury launched on SpaceX-15, on June 29, 2018, from Cape Canaveral Air Force Station, Florida. Mercury returned to Earth on SpaceX-15, splashing down in the Pacific off the California coast on August 3, 2018. For details on the flight profile for Mercury, see the SSEP Mission 12 to the International Space Station (ISS) page. Some student flight teams present at more than one annual conference, reporting out status at various stages of the life cycle of a flight experiment. It is also true that not all student flight teams attend a conference. For details on all Mercury flight experiments, see the Selected Experiments on SSEP Mission 12 to ISS page. Abstract: How can we include powder from recycled plastic to the mixing process of cement to make it more suitable to space application? We are looking for new construction materials to make possible advanced manufacturing in space. How will the mixture of three materials in microgravity differ from those mixed on Earth? The material proposed here has the potential to mitigate some risks that cement could offer in the microgravity. The “green plastic” is a sustainable polymer provided by the Brazilian company Braskem and is used on the ISS with 3D printers of Made in Space. Abstract: This experiment determines whether microgravity influences the virulence of Kocuria rhizophila, using Caenorhabditis elegans. Nematode growth medium and dauer C. elegans in L-broth were added to a test tube. After two days, tryptic soy broth and Kocuria rhizophila were added. Three days later, formalin was added, terminating the experiment. The C. elegans killed by the bacteria and those fixed by the formalin were analyzed. Results were inconclusive because, all C. elegans in the control and microgravity experiments were killed by bacteria. Abstract: What impact does microgravity have on the growth rate of Lemna minor? Duckweed will increase its growth rate. Scientists have sent duckweed to microgravity and they found the growth rate increased. Duckweed can be used for many purposes like filtering dirty water, fertilizer for crops, biofuel, animal feed, and food for humans. Our pre-tests look to see if Lemna minor will survive in different conditions. Abstract: This experiment was designed to test the effects that microgravity has on the germination of Pueraria lobata (kudzu) seeds. We will analyze the results of our experiments by counting the seeds germinated and by measuring the hypocotyl lengths and masses of the samples. Our hypothesis is that microgravity will not have an effect on germination. If this is the case, kudzu could become a vital component of diet and health aboard the ISS and someday en route to Mars. Abstract: This experiment has been specifically designed to monitor the growth of soybean seeds in a micro-gravity environment in comparison to its growth on Earth. Two refrigerated soybeans will be activated through means of the growth medium on A+2. U-14 clamp B will be released as the deactivation medium. Observation of results include microscope use, root structure formation, and root measurements. We hypothesize an increase in root length and expansion of plant cells in set comparison to the Ground-Truth Experiment. Abstract: This experiment was designed to investigate how microgravity affects the developmental stages of brine shrimp. The brine shrimp will be in a dormant state in their cysts while launched into the atmosphere. Day A=0, clamp A will release salt water to hatch brine shrimp. U-2, clamp B will release formalin to stop the experiment. Understanding the developmental stages brine shrimp will go through in microgravity would be a valuable step into the possibility of growing aquaponics systems for long space travel. Abstract: What happens if babies are born in outer space? We simulated it with a different organism. This experiment was designed to monitor changes to space-born brine shrimp over a period of time. Some things we observed were movement, size, color, and internal organs. Dehydrated brine shrimp cysts were activated with water. Our ground truth results showed our experiment would not have worked, and we would need more water, less salt, and more air. We conducted an improved version to prove this. Abstract: Our question is what effects microgravity has on Lactobacillus casei, a beneficial strain of probiotics found in yogurt. In the future, if humans colonize in space, yogurt could provide a beneficial source of energy. Probiotics help to strengthen the immune system, and the calcium in yogurt can lessen the bone deterioration that occurs during long-term weightlessness. Moving forward, this experiment could help astronauts improve their health in space and provide a good food source for future space exploration. Abstract: This experiment will examine the effect of microgravity on the germination of spider plant seeds, and will determine if the spider plant can successfully grow in space. Indoor air pollutants are ranked among the top five environmental risks to public health. These chemicals are even more prominent in space and on the ISS, and spider plants would reduce up to 90% of formaldehyde, carbon monoxide, O-xylene, and P-xylene. Our findings would greatly benefit the health of future astronauts. Abstract: 80% of astronauts returning from the ISS suffer from visual impairment intracranial pressure syndrome (VIIP). Microgravity decreases outflow of cerebrospinal fluid (CSF) from the cranium, increasing intracranial pressure (ICP). This causes papilledema. We’re testing the effect of acetazolamide, which inhibits the enzyme carbonic anhydrase which catalyzes the dissociation of carbonic acid into bicarbonate and protons, on bicarbonate concentration in whole blood. Bicarbonate is necessary for the production of CSF, thus reducing bicarbonate production will reduce CSF, therein reducing ICP. Abstract: This experiment was designed to measure the reproductive rate of baker’s yeast (Saccharomyces cerevisiae) in microgravity as compared to its rate under Earth’s gravity. We will allow two identical yeast cultures to cultivate for three days. By determining the rates of reproduction, we will be able to determine the viability of yeast cultivation in space and any of its ramifications in scientific and economic development. This information will provide insight into growing organisms on extensively-timed missions. Abstract: We will analyze the effect microgravity has on the reproduction of the fungus Sordaria fimicola by studying the crossing over that occurs during meiosis. To measure crossing over, our experiment breeds together two colors: a black and tan strain. When Sordaria fimicola breeds, it creates ascii with eight ascospores each, and the arrangement of the colored ascospores can indicate whether or not crossing over has occurred. Another aspect that is visible is whether or not a mutation has occurred. Abstract: This experiment is to determine the hatching rate of Artemia salina in microgravity compared to gravity. Twenty Artemia salina cysts will be mixed with Saline water on U-5 when the first clamp is removed. On U-2 the second clamp will be removed, isopropyl will be introduced stopping further growth of the cysts. Analysis will be completed once the experiment returns to gravity to determine if the cysts hatching rate was the same as the ground truth experiment. Abstract: This experiment was designed to monitor the effects of microgravity on a 1 gram piece of iron which will be sent to the ISS to see if it can rust. A type 3 FME tube will be used and will contain iron, 0.5 mL of water, and 0.1 grams of cotton. This experiment will be conducted on Earth at the same time as the experiment on the ISS. Abstract: The experiment will address the problem of polydispersity of hydrophobic drug molecules when encapsulated by polymers under normal Earth conditions. The proposed experiment will test to see if microgravity conditions will result in monodispersed micelles, which could be used for drug delivery. The experiment includes the self-assembly of PEGMA around indigo dye, a hydrophobic molecule, in place of a drug. A PEG-dithiol crosslinker will add stability to the micelles formed. Title: Will Tardigrade Eggs Hatch and Develop in Microgravity? Abstract: This experiment is designed to see if Tardigrade eggs will hatch and develop in microgravity. Ten Tardigrade eggs will be sent to the ISS in the FME 3 tube. On U-14 the astronauts will release the first clamp to allow water and moss into the chamber holding the eggs. On U-2 the second clamp will be opened to introduce the fixative in the chamber. Analysis will include comparison of hatching rates and development of Tardigrades with the ground truth experiment. Title: What is the Effect of Microgravity on Radish Rate of Growth Compared to Here on Earth? Abstract: This experiment will compare the growth rate of radish seeds in microgravity and on Earth. The purpose is to see what will happen to the rate of growth of radishes in microgravity. Our hypothesis is that the radish seeds will grow slower or not at all in microgravity. For the ground experiment, an FME Type 3 Tube was used. The FME contains 3 radish seeds, cotton, water, and formalin. When the water is released to the seeds, we will analyze every 2 days and record observations. Abstract: Our experiment will test how oxidation affect steel. Iron III oxide is produced by the reaction of Iron, Oxygen, and water. Rust is produced by Iron oxidation, which is a reddish-orange, dirt-like substance. The FME tube will combine steel wool and humidified oxygen. The intention of the experiment is to help gather information about steel in space and if it could have the potential to serve other purposes in a microgravity environment. 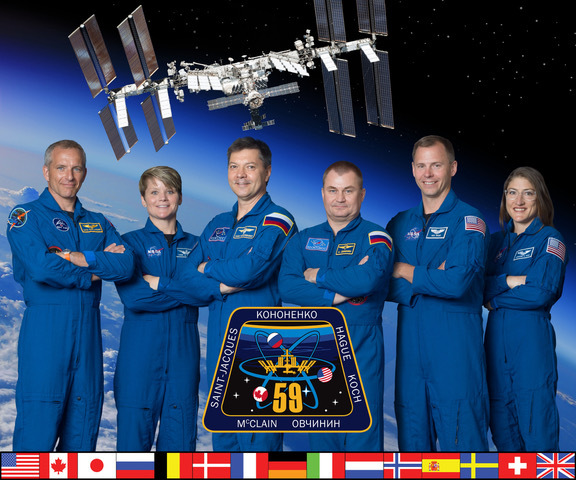 Abstract: This experiment seeks to determine the effect of microgravity on the decomposition of organic matter. Two FME tubes each containing two leaves of Lycopersicon lycopersicum and a dose of the chemical preservative formalin. Both samples will be refrigerated before commencement of the experiment. Upon sample’s return to Earth, analysis will occur to examine decay progress and compare the results to the sample that remained in normal conditions. Definite conclusions regarding decomposition differences will be drawn after all data is considered. Abstract: This experiment was designed to test the effects of ascorbic acid on the rate of regeneration of planarian worms in microgravity. A diluted solution of ascorbic acid will be mixed with the planarian on Day A=0 and after two weeks, they will be preserved in formalin to be examined back on Earth. Preliminary experiments have shown that the ascorbic acid does increase the rate of regeneration but we are yet to determine the effect in microgravity. Abstract: The main goal of our experiment is to see the effects of microgravity using root hormone on hydroponically grown muscadine vines. Background research has shown that muscadines are grapes native only to the Southern United States and have a relatively high yield; studies have also found that muscadines have antioxidants and cancer fighting properties. The project consists of creating muscadine vines in space in a three step approach, using root hormone, a muscadine cutting and water. Abstract: This experiment was designed to determine whether sodium polyacrylate would absorb water in microgravity allowing radish seeds to germinate. Sodium polyacrylate has been known to expand on Earth when it comes in contact with water. If zero gravity has no effect on the ability of sodium polyacrylate to absorb water, we predict the radish seeds will germinate. This would lead to further studies such as using sodium polyacrylate as an insulator to protect fragile samples brought back from space. Abstract: Our team will answer the question how Penicillium mold grows in a microgravity environment versus Earth’s gravity. The purpose of our experiment is to provide a viable solution to bacterial infections in space. Bacteria in space tends to act more violently so perhaps mold will act more furiously to kill bacteria. Our hypothesis is that it will grow better. Since gravity forces are seemingly limited in space, maybe the mold will grow larger than usual. Abstract: We want to determine how mushrooms adapt in microgravity. Our first step would be to see how mushrooms decompose in microgravity. We plan to send Enoki mushrooms to the ISS and determine the rate of decomposition while in a microgravity environment. Not many experiments with decomposition have specifically been done in space. There have been past experiments with the growth of mycelium in space, but nothing with the whole mushroom process itself. Abstract: A recently discovered bacterium, Ideonella Sakaiensis, has been proven capable of degrading Poly(ethylene terephthalate), or PET. We will compare the efficacy of the bacterium in a microgravity environment to that on Earth. Ideonella Sakaiensis and PET film are in the same MiniLab and we will measure and compare the degradation in microgravity and on Earth. This will help us gain a greater understanding of how to dispose of plastics, such as PET, while in space as well as on Earth. Abstract: Our query is will Solanum tuberosum (potato) seeds germinate in microgravity. If our project works, the process may be sustainable. Our hypothesis is the Solanum tuberosum seeds will germinate in microgravity because NASA tried different plants like Zinnia. They were successful. Potatoes contain lots of phytonutrients that have antioxidant activity which helps fight off cell damage in the body. We are using a Type 3 FME that contains water, Solanum tuberosum seeds, and peat mix. Abstract: The aim of this experiment is to determine the effects of microgravity on the germination of Apium graveolens. The FME utilized for the investigation will be type 3. The astronauts will unclamp clamp A to add the water to the soil and seeds. The fixative (formalin) will be added to the seeds to stop the development of the plant by asking the astronaut to unclamp clamp B and delicately shaking the tubes. The analysis will be precisely under similar conditions. Abstract: We seek to determine if there will be a change in grain size and distribution of processed gallium metal in a microgravity environment after a change of state occurs, wherein gallium is melted, then solidifies. We will compare the grain size and distribution using optical microscopy and the “Chart Comparison” method. Electron microscopy will reveal other materials present in the samples. Upon analysis of the results, we will be able to draw conclusions about the implications for unique mechanical properties.